The AquAid Wall Mounted Water Fountain, manufactured from polished stainless steel, features a durable design including a smooth radius front for safety, specifically for use in schools and high usage areas. 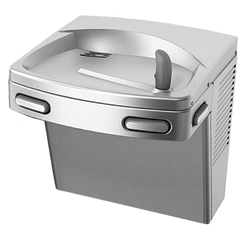 This machine, suitable for installation in both primary and secondary schools, dispenses a high capacity of chilled or non-chilled drinking water on demand, keeping students cool and refreshed throughout the school day. The water fountain also offers wheelchair access; anti-microbial copper push pads that minimise the risk of cross contamination; a flexible, anti-microbial, water-saver guard for added safety and optional brass bottle filler tap. Durable design, low running and maintenance costs. Anti-microbial copper push pads, minimising risk of cross contamination. Flexible, anti-microbial, water-saver guard for added safety. Optional brass bottle filler tap. Both chilled and non-chilled versions available. Cooling system – 134a non-toxic, non-flammable refrigerant. We provide the installation of your water dispenser in a location of your choice by EDWCA qualified and enhanced DBS checked engineers. There’s no need to call. For your peace of mind, machines are labelled with the date of their last sanitation and when the next one is due, we simply arrive to perform the service whenever it’s due. We also offer a full maintenance package which includes emergency call-outs in the event of a breakdown. With the installation of each Water Fountain AquAid offer 100 free water bottles for students, plus 2 posters suitable for the students’ age group. Installing a Wall Mounted Water Fountain not only benefits everyone at your school, by supplying you with drinking water at a push of a button, but also communities on other continents who we help gain access to clean drinking water. We achieve this through our ongoing support of both the Africa Trust and Christian Aid. By donating a portion of water, water cooler and dispenser sales to these charities we continue to ensure those in need have potable water for life.